Tarell Alvin McCraney Reimagines Shakespeare’s ‘Antony and Cleopatra’ in Haiti, as Lizzie SImon reports in this article for The Wall Street Journal. Of all the things that $625,000 can buy, the freedom to decline new projects means a lot to the playwright Tarell Alvin McCraney, who received one of the MacArthur Foundation’s “genius grants” in September. Mr. McCraney is currently in the midst of his most ambitious effort to date, “Antony and Cleopatra,” which will have its New York premiere at the Public Theater next week. The play, first published in 1623, has a reputation for being one of the most difficult in Shakespeare’s canon, with leaps through time and space and more than 40 characters. As the play’s editor and director, Mr. McCraney whittled the cast down to 10 players, but for the most part retained its language, characters and plot. Where he has realized his own vision is in the setting, placing the story not at the dawn of the Sicilian revolt but the Haitian Revolution. 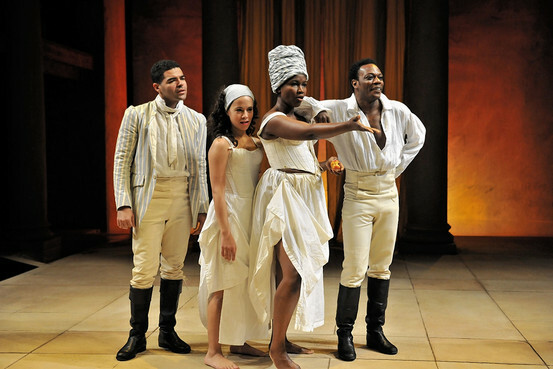 While Cleopatra and Antony remain, along with references to Egypt and Rome, the composer Michael Thurber has incorporated rara, a musical genre native to Haiti, and choreographer Gelan Lambert added French and Afro-Caribbean dance into the production. The production, whose cast is equal parts American and British, is in collaboration with the Royal Shakespeare Theatre in Stratford-upon-Avon, where it had its world premiere in November, and Miami’s GableStage, where it had its U.S. premiere in January. Miami is Mr. McCraney’s hometown, and there he helped develop a partnership with the public-school system that brought more than 4,000 local students to weekday matinee performances. “It was essential to Tarell’s vision to have an impact on Miami, to bring theater to kids who were like him,” said Oskar Eustis, the Public Theater’s artistic director. Since then, Mr. McCraney has had a handful of critically acclaimed plays produced on the New York stage. His trilogy, “The Brother/Sister Plays,” followed a family in Lafayette, La. “Wig Out!” was centered around drag performers in Harlem. And “Choir Boy,” which ran this summer at Manhattan Theater Club, was about the struggles of a gay prep-school student in the South. “Antony” received mixed reviews during its British and Miami runs, and Mr. McCraney continues to make adjustments to everything from the lighting to the performances.